Safe: Patent-Pending designs eliminate common failure points such as load-bearing welds and bolts. Secure: Hitch cannot be removed from bumper if locking pin used; other hitches can be unbolted. Strong: Hitch rated for 300 pound-feet of cargo carry, which exceeds most 4-bike racks and bikes. Stable: Tighten the hitch guide bolts once bike rack is inserted to reduce bouncing and shaking. Stylish: Unique design and high-gloss finish stand out from hastily-assembled, competing products. Why settle for an outdated, inferior 4-inch RV bumper-mounted receiver hitch when you can have a computer-designed, laser-cut, modern hitch for roughly the same price? With a HiLoHitch, you can transport the investment you've made in your bikes, bike rack, or cargo carrier in safety, style, and security. HiLoHitch bumper-mounted hitches are available in both 2” and 1-1/4” receiver sizes and are the only brand to offer dual-hitches featuring receiver openings both above and below the bumper in the same hitch. Find the HiLoHitch model that works best for you: HLB: Single 2” hitch, HSB: Single 1-1/4” hitch, HLL: Dual 2” hitch openings, and HLS: One 1-1/4” opening and one 2” opening. Most hitch receivers on the market today are made from steel tubing that leaves a 1/16” gap around your bike rack’s mounting bar. Because all the parts in our HiLoHitch RV bumper-mounted hitches are laser cut, we're able to provide much tighter tolerances, reducing the "slop" by almost 70%. Also, unique to the HiLoHitch RV bumper-mounted hitches, you have 2 options for mounting your bike rack or cargo carrier: 1. You can use your HiLoHitch in a standard receiver hitch configuration - sliding your bike rack in or out “normally” and retaining it in place with a hitch pin, or 2. You can use your HiLoHitch as a clamping hitch - tightening the guide bolts after inserting your hitch pin, clamping your bike rack tight to the hitch and significantly reducing the bouncing and shaking that plague most bumper-mounted hitches. Lastly, our patent-pending design has no load-bearing welds or bolts, eliminating these points-of-failure, so you can travel with the peace-of-mind that comes from knowing your cargo will arrive at your destination when you do. How do I get the 4SQUARE™ HiLoHitch™ RV Bumper-Mounted Hitch to Clamp My Bike Rack? Just tighten the two guide bolts until the sides of the HiLoHitch are tight against the mounting bar of your bike rack or cargo carrier. Will the 4SQUARE™ HiLoHitch™ RV Bumper-Mounted Hitch Fit My Camper? The 4SQUARE™ HiLoHitch™ RV Bumper-Mounted Hitch is designed to fit the 4 inch square bumper found on many RVs and travel trailers. 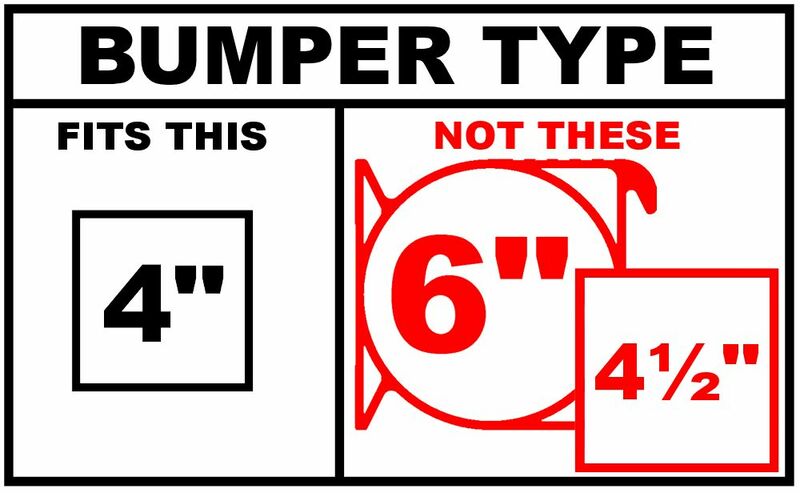 If you believe that your RV has unusually tight tolerances around the bumper, you can use our handy 4SQUARE™ HiLoHitch™ RV Bumper-Mounted Hitch for Bike Racks & Cargo Carriers Dimensions chart. Can I Use this Product to Tow? No. The 4SQUARE™ HiLoHitch™ RV Bumper-Mounted Hitch for Bike Racks & Cargo Carriers is designed to support hitch based accessories only and is not designed for towing.